The United Nations estimates that one quarter of Asia’s population, or about 1.3 billion, will be over 60 years old by 2050. This demographic change forces policy makers to reckon and rethink whether our existing policies and practices are reflective of this new ageing reality. Khoun Sudary, Chairperson of the Asian Cultural Council (ACC), said at the third meeting of Asia Europe Political Forum on April 6 that “the challenges arising from ageing populations are real and will have significant impacts both at the regional, national and individual level”. “Increasing old-age dependency ratios across the region and fiscal constraint in providing social pensions and institutional care are two emerging trends that national policy makers will have to reckon with. Traditional family-based care system and community cohesion is declining, even in our Asian societies that are known for centuries as strong collective and caring societies,” she added. The elderly, mainly Asians, who are protected by a social system and community bonds, are increasingly vulnerable to this rapidly changing family dynamics. Even in advanced societies, other related issues of an ageing population are a rise of income insecurity for the elderly, a widening of inter-generational disparity, with women more likely to be disproportionately affected. The Colombo Declaration issued by the members of the International Conference of Asian Political Parties (ICAPP) stressed the importance of international cooperation to develop evidence-based policy recommendations on ageing populations. It also promotes “age-sensitive and all-age-inclusive national and local policy development and implementation, with measurable indicators to track progress on the situation facing older persons”. The members are encouraged to adopt social policies that promote the development of community services for older persons, taking into account the psychological and physical aspects of ageing and the special needs of older women and older persons with disabilities. A whole-of-government approach is needed to address the issue of a fast-growing ageing population in Asia. 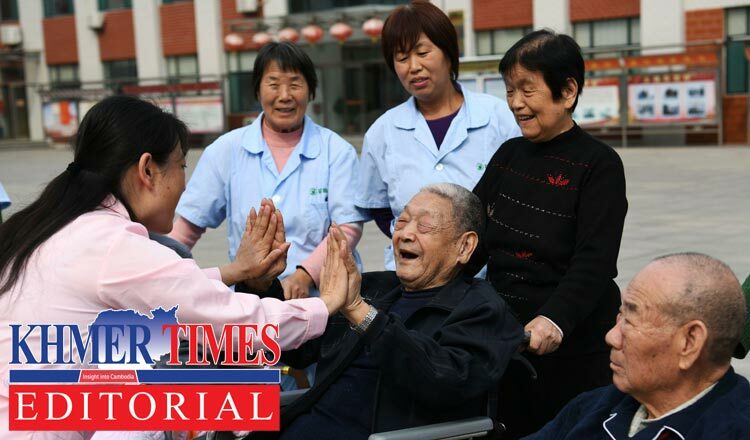 The public and private sectors, civil society organizations and families must work together to promote and provide basic care and social services, bearing in mind specific needs of the elderly. Age-friendly and age-sensitive social and economic programs should be further developed. In Cambodia, the government has adopted the National Policy on Aging Policy 2017–2030 to achieve the ultimate goal which is to help older people participate with freedom and dignity in development activities especially those related to enhancing the well-being of the elderly. The policy stresses three interconnected concepts: (1) to eliminate age-based discrimination so that older persons are guaranteed the same rights as younger persons and treated on par with them in all respects; (2) to ensure gender equality by focussing more on women who form the majority of the older population and are more vulnerable than their male contemporaries and (3) to promote intergenerational relations so as to maintain the strength of the joint family system, a hallmark of Khmer culture.